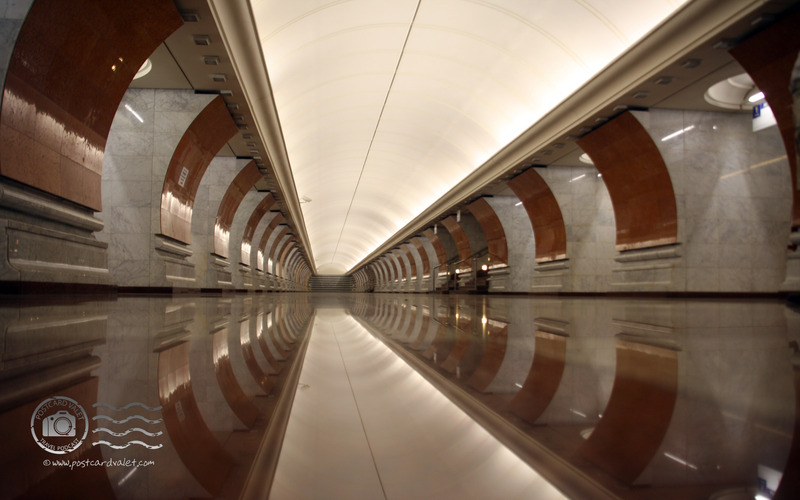 I could spend an entire vacation exploring Moscow’s Metro system. Seriously. 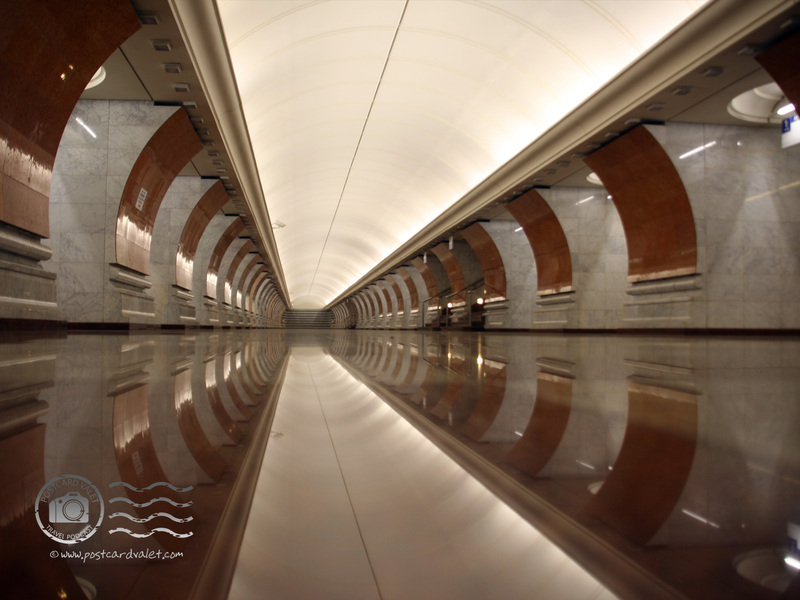 While we were in Russia last summer, Oksana’s brother encouraged us to the use the metro as our primary means of travel around the city. Whenever he was with us, which was more often than not, he’d steer us toward roundabout routes just so we could catch a glimpse of a new station. Each station is designed with a different style. Some are covered in ornate scrollwork, some in mosaic tiles, others have murals between every arch. Some, like Victory Park Station, almost qualify as science fiction. I think it was after the first long day of touring the city that I took this picture. We were on our way back to the apartment, it was late, but Andrey decided that we need to take a look at Victory Park. Парк Победы, as it’s known in Russian, commemorates Russian’s victory in World War II. There’s an impressive museum on the grounds and all sorts of WWII relics both inside and out. We returned to see all that later. The first night was just to see the station. Amazingly, the throng of humanity in most of the metro (even at that time of the night) was absent. Between trains, Victory Park station almost emptied out entirely. As we walked down the length of the corridor to get a better view of the murl, we passed only a couple communters and one lone janitor buffing the highly-polished floor tiles. After taking pictures of the mural and getting an Oksana-sponsored translation of the plaque, I turned around to see the entire station, empty. I took a couple pictures of the impressive marble and reflections — portrait, landscape, next to the wall, out in the open — before I had the idea to just set my camera on the floor. The first snap, on auto, fired the flash and created an arching shadow where the lens blocked the light. I could hear another train pulling into the station, so I rushed to manually turn off the flash and snapped one more photo. Shortly after this picture was taken, the station was full of people again.